A WEEK AWAY - then away I go! The Arizona Fine Art EXPO is just a week away from closing for the 2018 season – then away I go – from Studio #29 under the big white tent back to my studio in Scottsdale. Meanwhile, my hands continue to work the ropes as I wend and wrap and weave original 3-D wall sculptures into original works of art. I would be pleased to collaborate with you to create special custom works of art for home or office. I’ll visit your place, discuss sizes, shapes, mediums and fiber colors – even hang the piece for you! Courtesy to the trade. Arizona Fine Art EXPO is located on the corner of North Scottsdale Road & Jomax open daily 10 am – 6 pm through March 25th. My love of metal (especially copper) creates a centerpiece for your home or office – not only works with woven fiber, but as stand-alone pieces. Here are some of my newest original designs. I cut sheets of copper into geometric shapes – creating 3-D wall sculptures by stacking and connecting to form the structure – often applying straight, bent or circular copper tubing as details and focal points. Works with woven fiber becomes the soft to the hard metal – textures of silver solder and flashes of patina, convey tonal variation to both. On their own and/or as embellishments, turquoise stones and feathers figure prominently in many of my works. I’m here in Studio 29 at the Arizona Fine Art EXPO for just two more weeks! The big white tents on the corner of North Scottsdale Road & Jomax are open daily 10 am – 6 pm through March 25! Courtesy to the trade and collaborative custom commissions available upon request. The cross has been used as a meaningful symbol in many cultures throughout the centuries and people from all walks of life continue to collect examples. 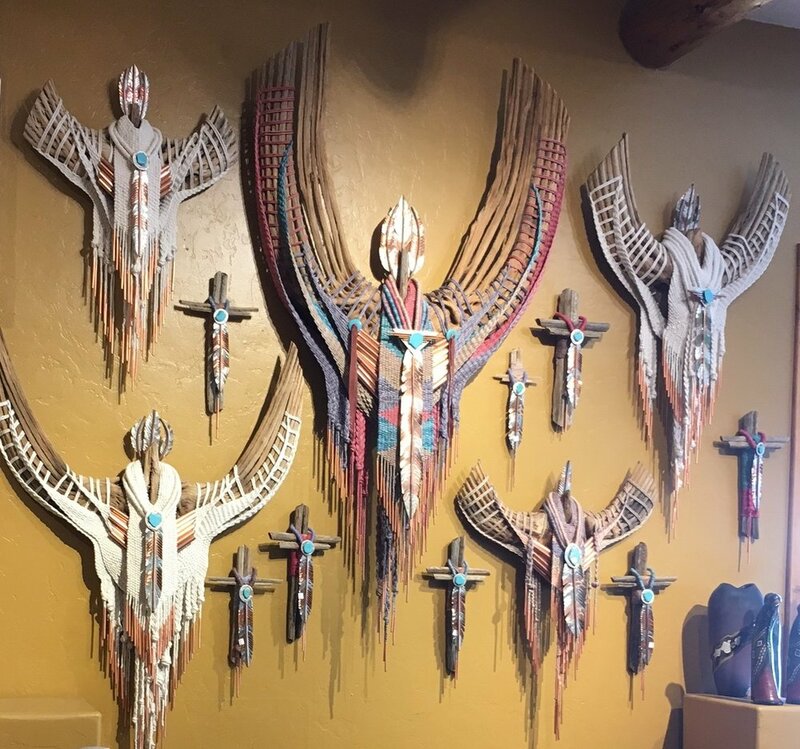 Along with the spirit of my Shaman Collection, I feel an affinity to the cross as well and create these versions using cut dried saguaro cactus to form the traditional framework. 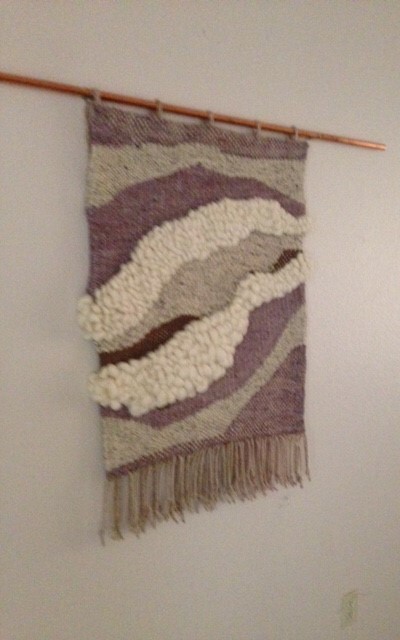 I weave and knot the piece together using either natural or hand-dyed cotton fibers. Hand-cut metal and turquoise stone complete the artwork. 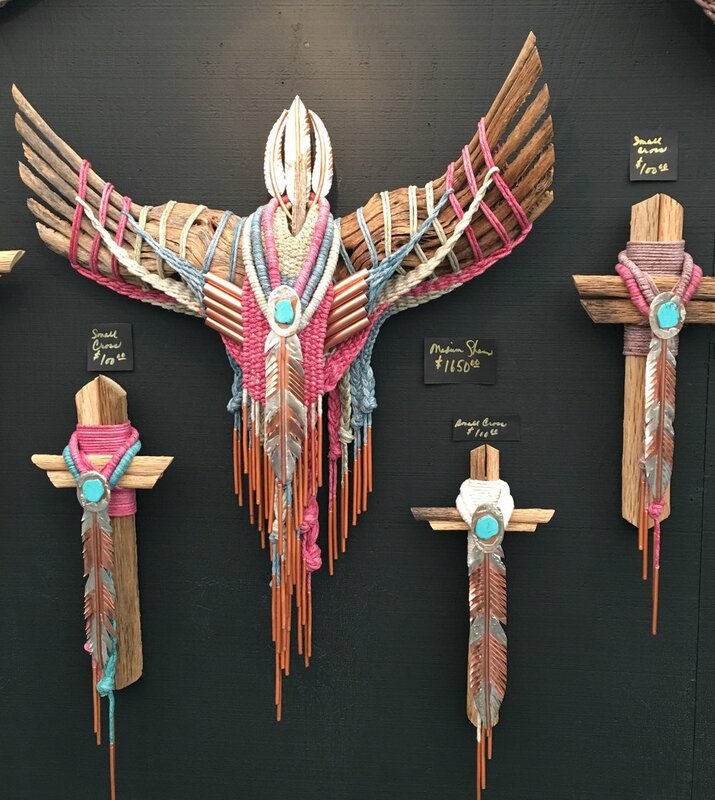 Visit me in STUDIO #29 to choose from a significant selection or talk with me about collaborating on a custom cross of your design. Be sure to make your plans to visit the 2018 Arizona Fine Art EXPO – open for just one more month. The February 14 issue of The Foothills Focus features a focus article on my sculptural wall hangings. Look for it in your mailbox, on the racks across town, or online. Thank you to arts columnist Shea Stanfield. It’s a pleasure to be in the company of so many creative artists at the Arizona Fine Arts EXPO and I want to especially thank fellow EXPO artist Kelby Love who took the above photos. And in turn I share with you a photo of myself, Kelby and his artwork in his STUDIO #31! EXPO - Fine Art Wall Sculpture in Booth 29! Excited to share images of new wall sculptures in combinations of woven fiber and metal in various stages of development. I guess you’ll just have to stop by Booth 29 at the Arizona Fine Art EXPO to see the progress and finished pieces perfect for home and/or office. I am also happy to collaborate with you - we will work together to create your special custom design. 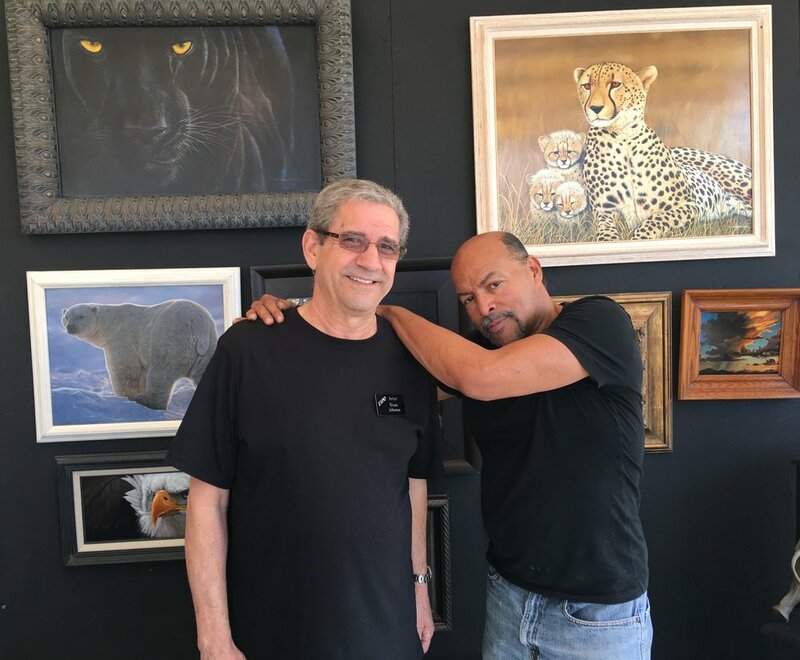 Arizona Fine Art EXPO is open daily 10 am – 6 pm now through March 25 in a pleasant and casual desert setting at the corner of North Scottsdale Road and Jomax. I’m in Booth 29 at the Arizona Fine Art EXPO and look forward to showing you my new wall sculptures. New! As in natural and hand-dyed cotton fiber intricately woven around and between true bone elk antlers. This is the first and is ready to hang on your wall or niche! I have a little bit of trimming to do here and there in the gray & white below. This piece is quite dramatic in daylight and even more so when subtly lit in the evening – casting shadows that definitely increase the 3-D effect! Exposure! Arizona Fine Art EXPO 2018! Excited to share with you the 2018 EXPO brochure that features one of my woven hanging sculptures! Excited to invite you to view more of my original wall sculptures at the Arizona Fine Art EXPO during the upcoming 10-week exhibition under the big white tents at the corner of N. Scottsdale Road and E. Jomax. The 14th annual ARIZONA FINE ART EXPO is open January 12 – March 25 from 10 am – 6 pm daily. I’ll be happy to discuss my work and help you select just the right piece(s) for your home or office. Come early in the season for the greatest selection. Collaborations welcome! Courtesy to the Trade! See you soon! My first year participating in the Hidden In The Hills Tour at High Desert Creations Studio #13 was GREAT! And meeting so many art lovers who appreciated my creativity and were inspired to own my works of art added to the greatness. Both Shamans and crosses were popular. I love what I do and am happily creating more pieces of all sizes for the upcoming Arizona Fine Art EXPO which opens in the new year on January 12, 2018. The great exhibition hall under the big white tent at Jomax and North Scottsdale Road will be open 10 am – 5 pm every day through March 25. Tour HITH STUDIO #13 - open only 3 more days! I’m having such a great time being a guest artist at High Desert Creations HITH Studio #13! I’ve met so many art lovers – collectors, patrons, enthusiasts – and look forward to welcoming you this Friday (24), Saturday (25) and Sunday (26)! 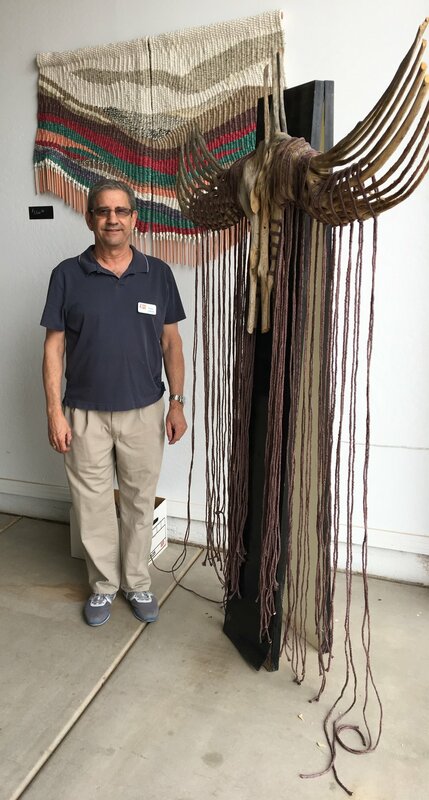 While I create sculptural wall hangings of all sizes, take advantage of this great opportunity to watch me at work while I weave hand-dyed cotton fiber rope, drape and finish one of my largest Shamans. For just three more days, STUDIO #13 will be open 10 am – 5 pm at 31616 N. 70th Street (N. Scottsdale Road & E. Lone Mountain Road). HITH TOUR & SALE is ON! I’m all set-up at High Desert Creations HITH STUDIO #13, 31616 N. 70th Street (N. Scottsdale Road & E. Lone Mountain Road). The weather is perfect and I will be here to help you select the perfect sculptural wall hanging for your home or office. STUDIO #13 is open 10 am – 5 pm on Friday, Saturday & Sunday, November 17, 18 & 19 and 24, 25 & 26. I'm a HITH ARTIST in SOUTHWEST ART! The upcoming HITH Tour & Sale is highlighted in Southwest Art Magazine's November issue on pages 52 & 53. I will be at High Desert Creations HITH STUDIO #13, 31616 N. 70th Street (N. Scottsdale Road & E. Lone Mountain Road) open 10 am – 5 pm on Friday, Saturday & Sunday, November 17-18-19 and 24-25-26. I work with a number of materials and mixed metal is another. Primarily geometric – square, rectangular, rounded. Hand-cut shapes of 100% copper are stacked and accented with copper tubing, textures of silver solder and flashes of patina. CONTEMPORARY Wall Sculptures & Hangings! A niche has been filled! My sculptural wall hangings are a perfect fit for the classic recessed niches found in so many homes today, as well as the generous wall space created by vaulted ceilings. Wall sculptures range in size: 2’ x 3’ up to 5’ x 8’. Courtesy to the Trade is offered and collaborations are welcome. From down south and up north to my Scottsdale Studio came a truckload of locally sourced dried saguaro cactus skeletons. With cotton fiber, copper, and turquoise stones on hand/in hand, I am inspired. My creativity is unstoppable! I’ve labored all Labor Day Weekend to finish several distinctive wall sculptures! Here’s the Shaman hanging around in my studio waiting to be professionally photographed. Both Shaman and the woven rope hanging will be in my portfolio soon. I'm still located in Scottsdale, but have just moved and am enjoying a larger home and a larger studio space. I am gathering more materials and building a wider collection of mixed media sculptures. While working with the saguaro cactus is my favored medium, I also create metal 3-D wall hangings which are primarily geometrical in design – often flashed with patina.